The Samoan "village" at the Pasifika Festival in Auckland in March 2007 was by far the biggest of them all. No wonder, since the Samoan community is the largest non-indigenous Polynesian community in Auckland. 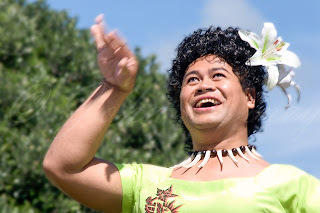 (The Pasifika Festival, by the way, features the Polynesian races of the south Pacific island, and does not include the Polynesian natives of New Zealand, the Maoris. As mentioned in the previous post, Fa'afafine at the Pasifika Festival 2007, fa'afafine are cross-dressing Samoan males. They took the stage at the Samoan village before a very large crowd. This photo is of one of the fa'afafine performing with her group.